This is the second post in a Series called "Getting Ready for Spring". 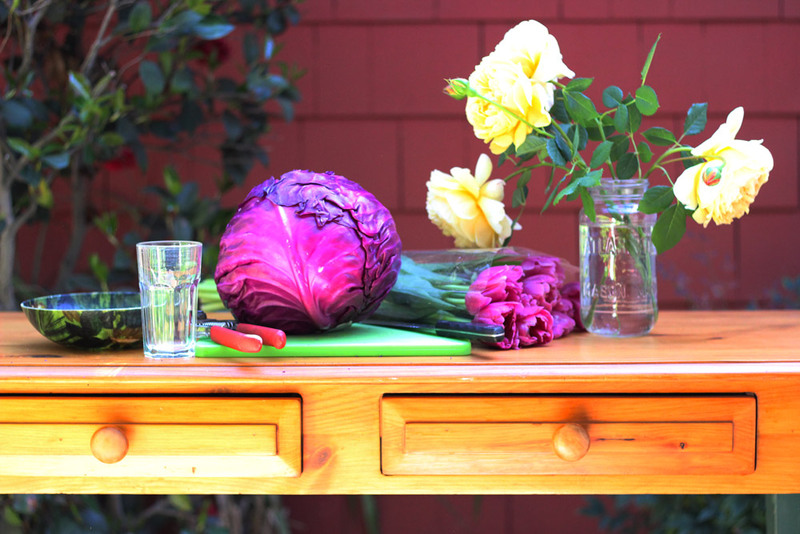 Cabbage vases are all the rage. They are colorful, unique and a great way to showcase your flowers. As we are getting ready for spring, tulips are now in bloom. These tulips were large and particularly colorful with yellow stamens. They opened up beautifully. One word of caution however, once you place the tulip stems, don't try to rearrange them, as they break easily. The yellow David Austin roses came from the farmers' market and were stunning. For instructions on wiring the roses see: http://www.floristinyou.com/prep The yellow in the roses is a great contrast to the purple of the tulips and cabbage. They are complimentary colors, meaning they are opposite each other on a color wheel. 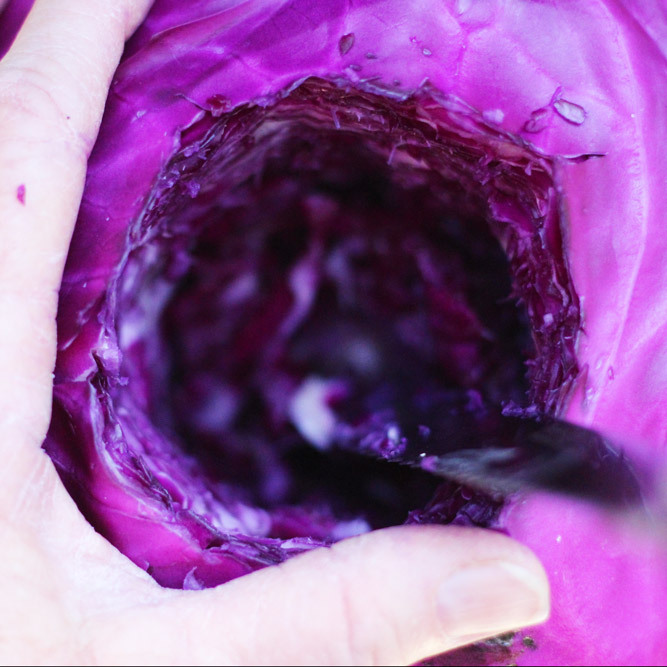 Once you have your flowers and supplies, let's get going. Spring is coming you know. 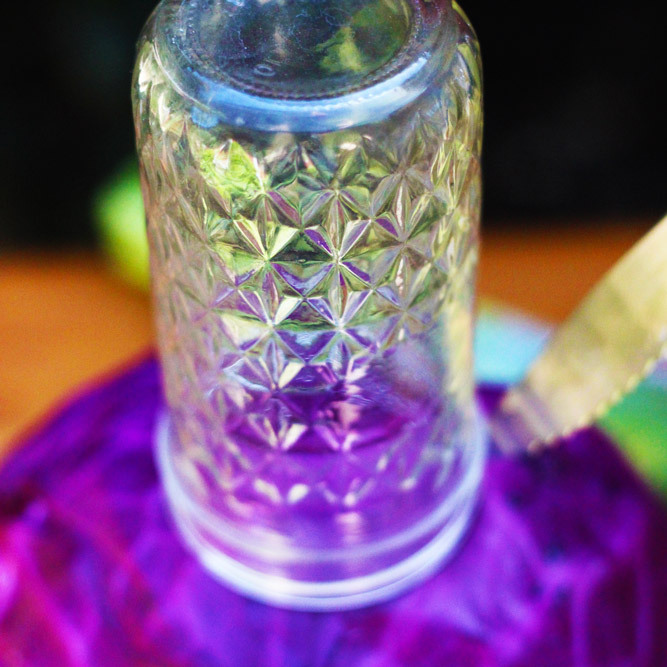 Take a jar with a mouth slightly larger than the tapered glass and cut around its edges. 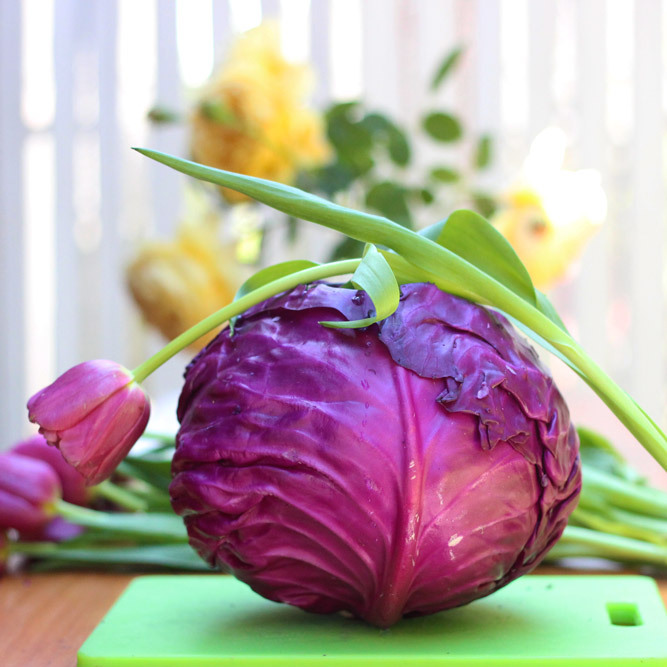 Cut and twist knife to get cabbage out. 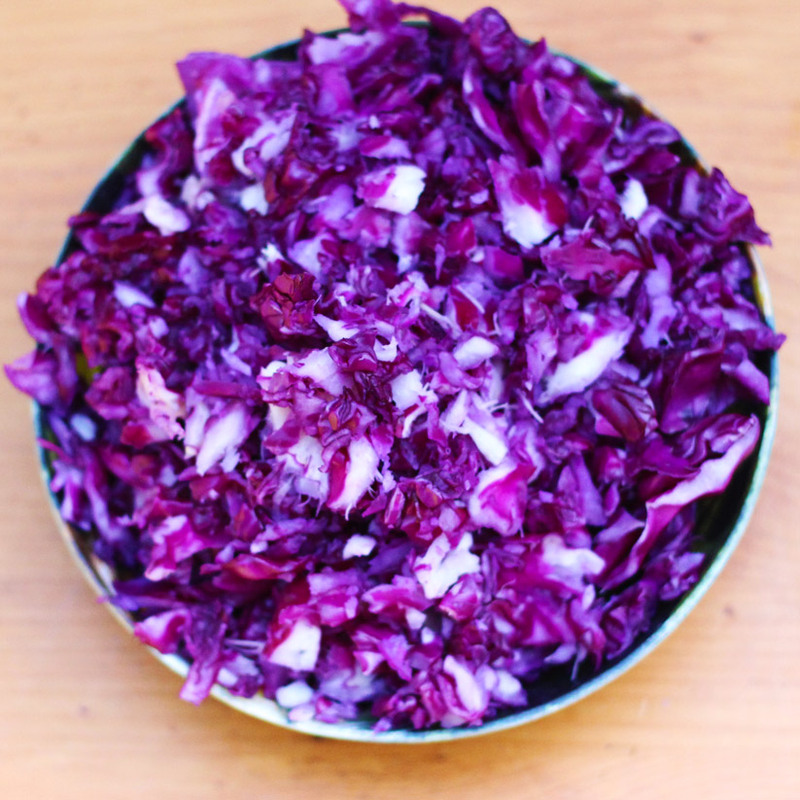 OK, this cabbage is ready for coleslaw. Insert 8 ounce tapered glass. Fill with water to 2 inches below rim. Measure length of tulip with eye. 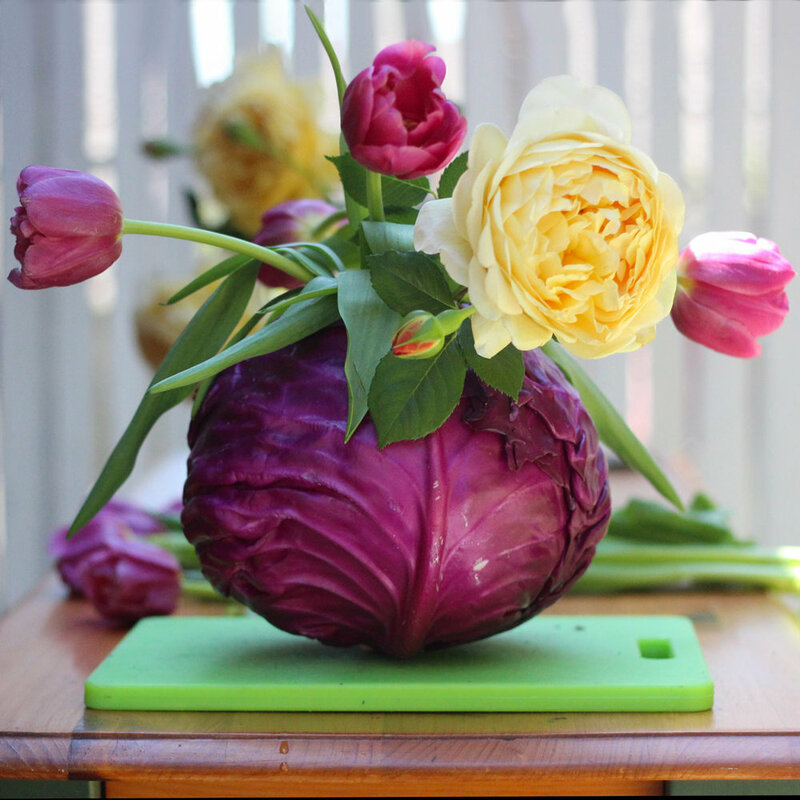 Cut tulips and place 5 in cabbage. Wire roses. Add first rose to right bottom. Add next 2 roses and fill with tulips. Repeat roses on sides. The David Austin roses are lusious. 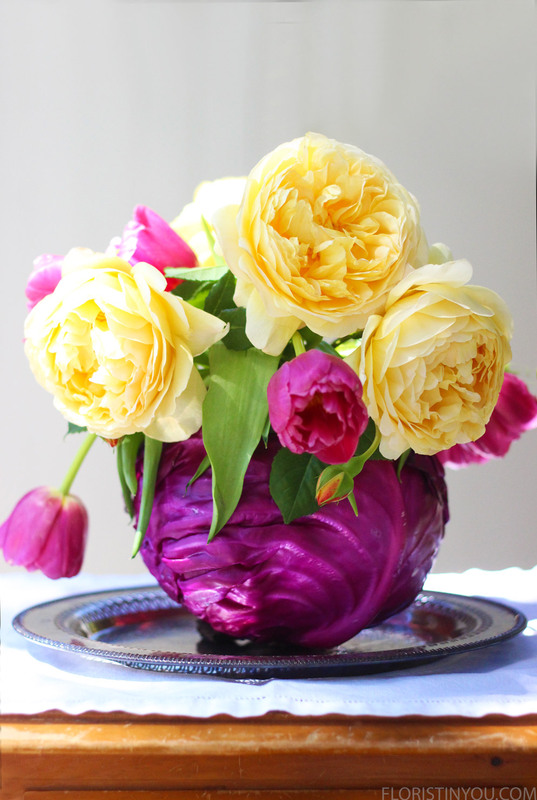 The cabbage looks like gathered satin. A great color combo, violet and yellow accented with bright green.